Decks are a core part of South Florida living, whether you are enjoying the cool, salty breeze from your custom-built beach house or soaking up the sunlight in your backyard. When it comes to outdoor deck design, one of the most significant choices you make will be material. How is the material going to look? Will it match the rest of your house? Is it weatherproof and durable? What’s the effect on your home’s resale value? By all appearances, wood seems to be the only material to choose from. However, there are many different varieties of wood, as well as vinyl that can be made to look like wood. Here are some of the options we recommend when we design and construct decks for our clients, whether built from scratch or part of a home addition. 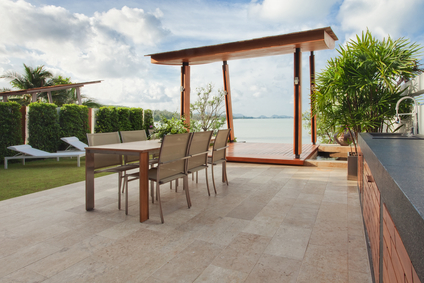 As stated above, wood is by far the industry leader in outdoor deck design. You can use pine or cedar, as well as a composite, or even choose from a few more upscale, exotic options. Though wood is quite durable — even more so if pressure-treated — its one drawback is its susceptibility to “warping,” in which it bends due to chronic stress. Pine is the most popular wood material. It is often not only the cheapest material, but also the most cost-effective, as u save money both at the point of purchase as well as over time from maintenance or the need for replacement. Wood composite can be made from a number of combinations of lumber, other woods and vinyl. Combining the durability of vinyl with the aesthetic advantage of lumber wood, wood composite has the advantage of not warping or splitting. At the same time, it provides the exact same appearance as wood, and is barely distinguishable from it.